Customer Service Review, Inc. is a Quality Monitoring and Performance Measurement and Training firm. They specialize in the development and improvement of customer service, sales and retention skills of front-line call center personnel. 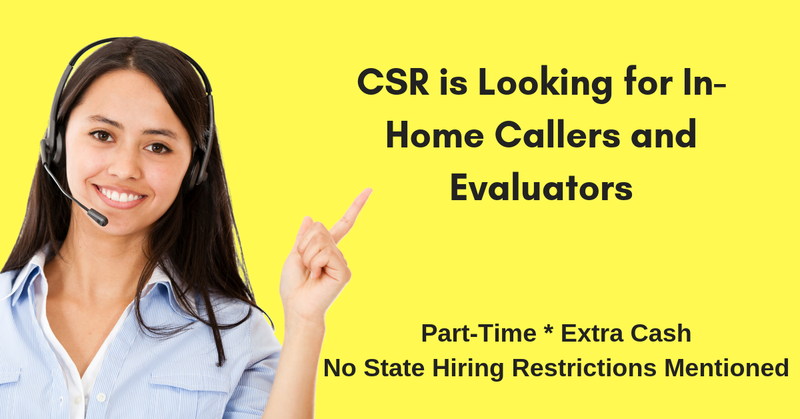 The company continues to seek work from home Callers and Evaluators. No state hiring restrictions mentioned. We are a legitimate work at home opportunity. Our company has been in business for almost 25 years, based in Pennsylvania, but providing Quality Monitoring for contact centers across the country. From time to time, we have open positions for people who are looking for flexible hours and the opportunity to make extra money. This is ideal for former career people who are now stay at home parents looking for a part-time commitment and some extra cash. This position will not work for people who are currently employed full time or seeking full time employment. This is an independent contractor position. Compensation is based on the degree of difficulty of each project. Please review the requirements below and submit your resume if you meet the requirements. Should a position become available and you meet the qualifications, CSR Inc. will contact you. This entry was posted in Hiring Companies, Work at Home Jobs and tagged CSR, Inc.. Bookmark the permalink.